What is Microsoft Azure Cost Management? Microsoft Azure Cost Management is a cloud spend monitoring application that empowers organizations to mitigate their costs for the Microsoft Azure, Amazon Web Services, and Google Cloud platforms. 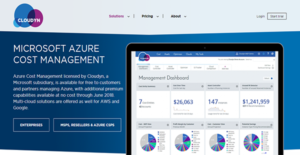 Other than tracking actual cloud spend, Cloudyn, a Microsoft subsidiary, also provides you with insights you can utilize to optimize your budget and to prevent overspending through Microsoft Azure Cost Management. In that regard, the solution alerts you immediately when it encounters spending irregularities and usage ineffectiveness for you to improve your cloud expenditure. Microsoft Azure Cost Management can also help you in creating budgets for business units and projects as well as setting their spending limits. The latter can instantly alert stakeholders in case of overspending. Thus, your teams become accountable for their expenses. With Microsoft Azure Cost Management, you can rest assured that you do not go beyond your cloud budget. That is because the application provides you with the means to monitor your cloud-related expenditures in real-time. You can gather data about cloud usage and billing by interfacing Microsoft Azure, AWS, and Google Cloud with Microsoft Azure Cost Management. This connectivity enables you to gain in-depth insights regarding cloud resource consumption and costs across different cloud services on a single window. Apart from that, the application also provides your staff with the tools for creating custom dashboards for them to access data relevant to them easily. Aside from giving you the means to monitor your cloud spend in real-time, Microsoft Azure Cost Management offers you tools that can help you prepare for the future when it comes to your cloud services. The application has a forecasting feature that reads your historical data to improve its accuracy. With the insight you gain from this, you can better prepare and plan your cloud budget. Instead of having an inflexible organizational cloud budget, you can allocate costs to teams and projects. This gives your units accountability when it comes to their cloud-related expenditures and empowers them to provide access to data to the right personnel. Furthermore, Microsoft Azure Cost Management lets you create budget thresholds so you are alerted instantly when a unit or a project is at risk of going beyond the allowable cost limits. If you are considering Microsoft Azure Cost Management it could also be beneficial to analyze other subcategories of Best Cloud Management Software gathered in our base of B2B software reviews. Since each enterprise has specific business wants, it is prudent for them to desist from searching for a one-size-fits-all ideal software system. Needless to say, it would be futile to try to find such a platform even among widely used software applications. The intelligent thing to do would be to list the various vital factors that require consideration such as main features, budget, skill levels of staff members, company size etc. Then, you should do your homework thoroughly. Read some Microsoft Azure Cost Management reviews and check out each of the other systems in your shortlist in detail. Such in-depth homework can ensure you discard ill-fitting systems and choose the solution that offers all the elements you need for business success. How Much Does Microsoft Azure Cost Management Cost? Microsoft Azure Cost Management for Microsoft Azure is free for the standard features and thus has no enterprise pricing while the premium capabilities remain free only through June 2018. Enterprise pricing will become available later. Meanwhile, Microsoft Azure Cost Management has an enterprise pricing for the standard and premium capabilities for Amazon Web Service and Google Cloud. We realize that when you make a decision to buy Cloud Management Software it’s important not only to see how experts evaluate it in their reviews, but also to find out if the real people and companies that buy it are actually satisfied with the product. That’s why we’ve created our behavior-based Customer Satisfaction Algorithm™ that gathers customer reviews, comments and Microsoft Azure Cost Management reviews across a wide range of social media sites. The data is then presented in an easy to digest form showing how many people had positive and negative experience with Microsoft Azure Cost Management. With that information at hand you should be equipped to make an informed buying decision that you won’t regret. What are Microsoft Azure Cost Management pricing details? What integrations are available for Microsoft Azure Cost Management? You can interface Microsoft Azure Cost Management with Microsoft Azure, AWS, and Google Cloud to retrieve cloud spend data. If you need more information about Microsoft Azure Cost Management or you simply have a question let us know what you need and we’ll forward your request directly to the vendor.